inscription: White VIZ logo at the bottom right of the image. "Yu-Gi-Oh (c) 1996 by Kazuki Takashani/Shueisha Inc." printed in black at the bottom left corner of the poster. Poster shows a cartoon character with blonde and red spikey hair in a blue jacket with a miniature figure form of himself in his right hand and two dice (red and blue) rolling out of his left hand with an inverted pyramid necklace with the eye of Horus on it. Behind the figure are vertical lines of blue glyphs on a black background. Around the image is a background that transitions from orange at the top to yellow at the bottom. At the top over the image and background is "curelty to animals is no game" in blue. A white explosions graphic at the right near the center has black text about free stickers. 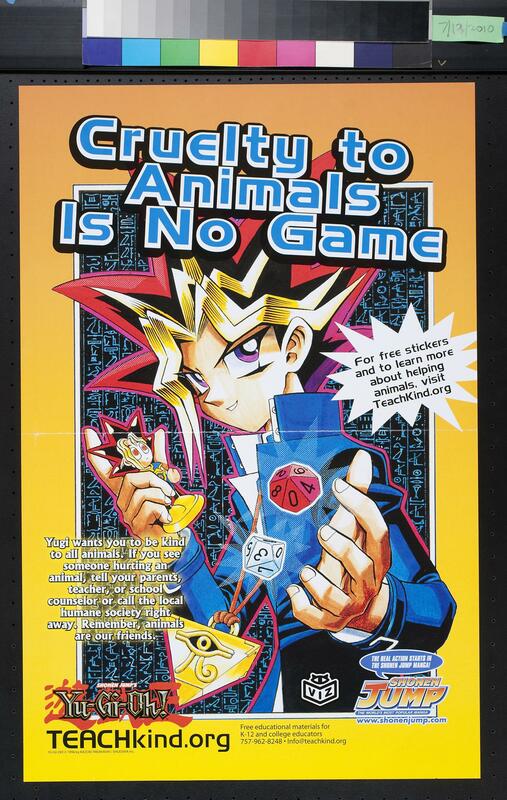 A the left near the bottom is white text about "Yugi" the cartoon character who wants kids to be nice to animals. At the bottom right are the Yu-Gi_oh and TeachKind logos. A thte bottom right is the Shonen Jump (manga) logo. Versso has a green background with "Seven Easy Ways To Prevent Animal Suffering" on the left in black and pink text and the text of an interview with Yu-Gi-Oh creator Kazuki Takahashi at the right.